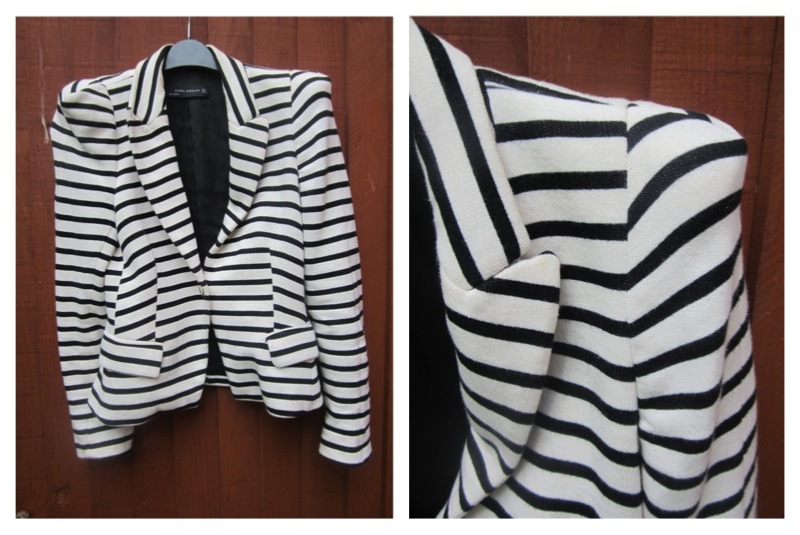 The story with this blazer is; It's an old school Zara blazer from a few seasons ago. A good few seasons ago. Back then when I was lusting for it in a Zara sale I done the wrong turn and left it behind. Forward on a few years and finally I got my mitts on it. My new addiction (which has been for a while) is Ebay. You never know what you may find. Some good quality stuff and if your lucky instead of bidding endlessly you can get things at a good rate..
What do I love about this blazer.. Well look at it. The power shoulder is what is simply amazing, along with the structure of the blazer and last but not least the classical nautical stripes. I'm in awe! I've worn this blazer twice this weekend. If you follow me on Instagram you've probably come across it in my posts.